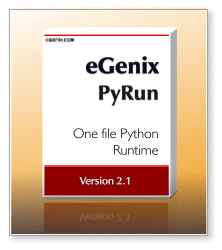 eGenix PyRun™ is our open source, one file, no installation version of Python, making the distribution of a Python interpreter to run Python based scripts and applications to Unix based systems simple and efficient. Compared to a regular Python installation of typically 100MB on disk, eGenix PyRun is ideal for applications and scripts that need to be distributed to containers, VMs, clusters, client installations, customers or end-users. eGenix has been using eGenix PyRun internally in the mxODBC Connect Server product since 2008 with great success and decided to make it available as a stand-alone open-source product. Install a complete Python runtime including dependencies in one go: using our install-pyrun installation bash script, you can install PyRun as well as all dependencies using a single install-pyrun -r requirements.txt run. If you want to ship your product with PyRun and need external libraries for PyRun to link against, simply place them into the same directory as the PyRun executable. PyRun comes with an rpath setting to first look in the PyRun binary's directory for share libraries to simplify this often needed setup. For more details, please see the documentation.